The 2018-19 data below are intended to serve only as informal reference points for comparing schools on specific criteria and not as definitive benchmarks as to which school is better than another for you. Our site does not offer an overall ranking of schools, because overall rankings can imply that one school is objectively better than another, which is never the case. 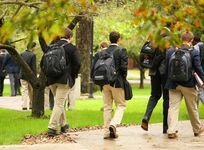 Schools differ in their educational approaches and campus environments, and only you can be the judge of which school is the best school for you and what you need.